Hi to all my lovely readers!!! Few months ago I was tagged by PBeauty (on youtube) to do the "TAG: 8 Most Worn Items". And I didn't realize that I was tagged until she emailed me (which was extremely sweet of her) =) Thank you! So the tag is about listing your 8 Most Worn Items (in the past few months). 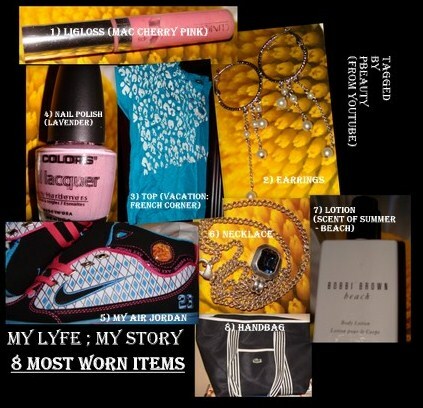 And here is my list of the "8 Most Worn Items"
And after listing my "top 8 items" I need to pass the tag on to others and I have decided to tag all the fellow readers to do this tag and it would be nice to see your top "8 Most Worn Items"
You can all post your link to your tag on the comments below! However, love your lipgloss that color!! The lipgloss is very pretty! Congrats! I love the necklace! Love the necklace!no wonder why it's your most worn one. Thank you for the taaaag! Nike sneakers are compfhy and nice :) I see why it is your most worn item! Thanks for tagging, but I don't understand it.. Thanks for your comment and for letting me know!!! Ufortunately, I can't do it now because my camera broke and I can't take photographs but I hope my new one will come soon!! great things, love your handbag! cool tag! it's always so interesting to see what others like to wear the most! Such great items you have!! Thank you for tagging me!! I will definitely have to do this very soon, soo fun!! Those earrings are totally adorable. I can definitely see why they are one of your 8 most worn items. Hi Rija! I love the color of the nail polish! I wear a similar kind! awesome list! thanks for the tag! will do this soon! :D the color of your nailpolish is really pretty! thanks for sharing your most used items! the nailpolish is a great color! very cool tag. that lip gloss looks so pretty! WHat a great idea for a tag!